Long time followers of this blog (if there are any) and my friends may remember that several years ago I made a silly little computer game called ‘buckthorn bash’. You played as a tiny little intern, frantically trying to kill buckthorn so maples could survive. The game was buggy and crude, and most frustratingly the area in which the game took place was very small – only a few maples could fit. 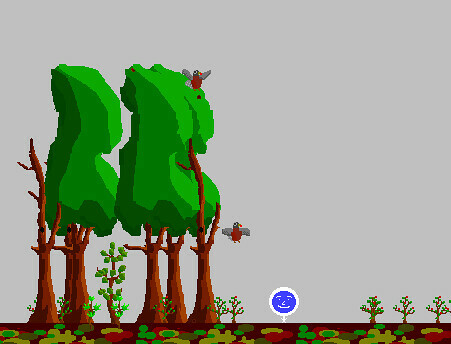 Well, Buckthorn Bash is back, this time in a 3-d Unity environment with much more going on. 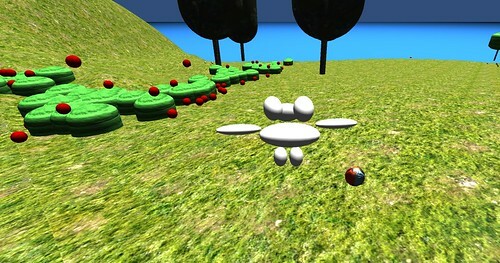 The game spawned from frustration with the passiveness of settings and environments in most computer games. At best they are to be exploited, and at worst they are no more than a cardboard set to look at as you run about. Here, while the game itself is very primitive, you may notice some interesting emergent behavior in the plants. You are a rabbit on a small island in Lake Champlain. The island has spruce, hemlock, cherry, and maple trees… and common buckthorn, an invasive species. The plants all grow, produce seeds, and die. each seed is produced randomly, so the plants won’t always act the same way. The idea is that the spreading buckthorn, left unchecked, would crowd out the other trees and take over. However, before it gets to this point, the current form of buckthorn slows down the game enough to make it unplayable. So your goal: manage the buckthorn such that it doesn’t slow down your computer too much. How do you do this? Easy! You aren’t any ordinary rabbit. You are a rabbit whose poop kills buckthorn instead of fertilizing it! Move the rabbit with the W, A, and D keys, and press space to shoot rabbit poop. I’ll leave it up to you to figure out what the buckthorn looks like and how to damage it, if you choose to at all. Or, you can try to maintain the diversity of native trees by shooting or pushing their seeds to new areas so they spread. In the current form, if the native trees are left alone hemlock tends to take over after a while. You can also just quit the game if it gets too slow, by closing the window or if really slowing down press control-alt-delete and closing the game. There isn’t really a goal – do what you want. The magical rabbit can’t swim. In theory, if it falls in the water it is reincarnated elsewhere, but sometimes, due to another bug, the rabbit dies and ends up just laying there while trees and buckthorn grow around over its head. Not fun at that point, so you’ll probably want to restart. This is just a demo. After fixing the bugs I plan to add a lot more – more species, more invasives, more thing the rabbit can do, different islands, you name it. If you have ideas let me know! Try the new buckthorn bash demo at https://github.com/naturalistcharlie/BuckthornBash/releases ! There are PC and Mac versions, scroll down to see the Mac version. Let me know if you play it and like it (or don’t like it) because I’ll probably be doing more with this soon. (you can’t get to this island right now). This entry was posted in Uncategorized on April 24, 2014 by slowwatermovement. I have created a folder with that name, and also one just named ‘Data’, and placed them in a folder in the root of the drive for good measure, with no joy. Windows version. It seems completely standalone, but would it be wanting to look to place data in a contemporary Windows /Users subdirectory? Oh, I think i know the problem. Sorry about that! Let me try to fix it real quick. It should have a new zip file to download in the next few minutes, that will now have that data file. Thanks so much for finding that! If it still doesn’t work let me know. I didn’t realize until you posted that, that my friends who tested it before all had Macs. … works like a charm. Although it seemed to want to default to rotating my screen, it told me up front and let me change that. It can be a bit sticky going backwards (down), and I can’t seem to find a way to end it without killing the process, even the taskbar window doesn’t give context controls on right-click. But hey, it’s like pre- to the pre-th power pre-alpha, so, not bad at all! Thanks! Yeah, it essentially has no interface of any sort aside from the game itself. It definitely needs an intro screen, key instructions, and i haven’t figured out why the reversing doesn’t work yet. There will be more to come eventually! BTW, nice call choosing Unity as a platform.